Perennial pepperweed (Lepidium latifolium L.) is a creeping herbaceous perennial that is currently invading New Mexico. While perennial pepperweed is capable of invading roadsides, pastures, alfalfa fields and many other upland sites, currently the majority of the infestations are found along riparian areas, irrigation ditches, floodplains and wetlands in New Mexico. Shoots emerge early in the spring forming a rosette which will persist for several weeks. By mid-late spring, plants bolt producing an inflorescence where flowers will develop. After seed production, flowering shoots senesce, although new rosettes can emerge in the fall in moist soils. Originally from Europe and Asia, perennial pepperweed is becoming widespread throughout the western United States. Currently, large populations exist in California, Nevada, Utah, Oregon, Idaho, Colorado, Montana and Wyoming. Perennial pepperweed was first discovered in New Mexico in 1932 in Rio Arriba county and is spreading throughout the state. Currently, large infestations exist in central New Mexico with new populations emerging throughout the state. Concern for large- scale spread is high as perennial pepperweed has the potential to invade disturbed areas high in salt concentrations. Rapid response and eradication of existing infestations is critical to prevent the spread of this invasive weed throughout the entire state. Perennial pepperweed produces stems ranging from 2 feet to over 4 feet tall. Mature plants produce numerous erect, semi-woody stems that originate from large, interconnected creeping roots. Roots can be herbaceous or form semi-woody crowns. Herbaceous roots are often creeping and are responsible for localized spread. Foliage is glabrous and green to gray-green in color. Rosette leaves are ovate to oblong with entire to serrate margins on long petioles. 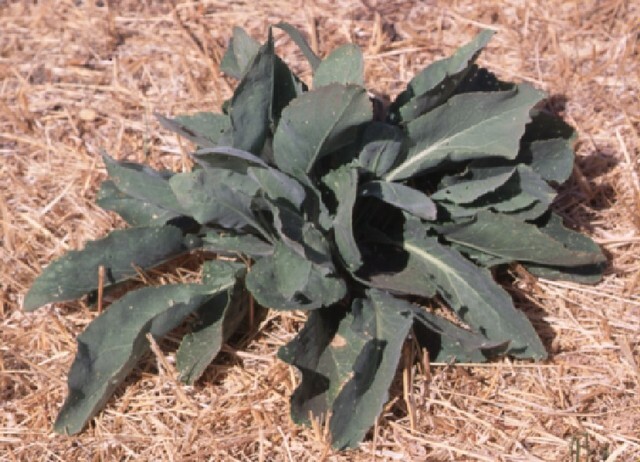 Rosette leaves are about 4 to 11 inches long and 1 to 3 inches wide. Leaves on the stem are sessile and lanceolate, have entire to toothed margins, and become smaller towards the top of the stem. Small, white flowers form dense clusters arranged in panicles at each stem. Perennial pepperweed is often confused with hoary cress (Cardaria draba) also called whitetop. However, unlike the taller perennial pepperweed, hoary cress stems are less than 3 ft tall and have leaves that clasp the stem and lack an obvious petiole (DiTomaso and Healy 2003). Perennial pepperweed can spread either by seeds or perennial roots. Infestations can produce over 6.4 billion seeds per acre annually (Young et al. 1998). Seeds rapidly germinate in laboratory conditions when exposed to fluctuating cold/warm temperatures, but few seedlings are observed in the field. Long distance dispersal is primarily from seeds, but seed germination is rare. Additional studies are necessary to establish what cues are required for seed germination (Miller et al. 1986). Viability of seeds in the soil may be short as seeds do not seem to be capable of surviving long periods in the soil. Plants primarily reproduce from perennial roots. Root segments produce adventitious buds capable of generating new shoots. Radial expansion of populations typically occurs from this method, producing a front of new shoots that can spread more than 10 feet from the parent plant each year. Roots can also fragment during erosion events and spread long-distances along river and irrigation canal banks (M. J. Renz 2002). Proactive management is the best approach for controlling perennial pepperweed since large, dense stands are difficult to control, especially in sensitive ecosystems near water. Frequent monitoring is critical to locate new plants before they become established. If new infestations are found, plants should be removed immediately to prevent further spread. Research has shown sites with new perennial pepperweed infestations tend to be easier and cheaper to manage (Eiswerth et al 2001). Large, established infestations are much more difficult and expensive to manage therefore preventing additional spread into uninvaded areas should be the top priority. If possible include revegetation methods to reduce the possibility of reinvasion after management. Establishing and maintaining competitive perennial vegetation can dramatically slow the introduction and spread of perennial pepperweed. Vigorous grasses, alfalfa, or cropping systems with annual tillage help prevent perennial pepperweed invasion and establishment in agricultural areas. Seedlings are easily controlled by hand-pulling or tillage, but these techniques do not control established plants because shoots quickly re-sprout from root reserves. Mowing and burning are not effective at reducing perennial pepperweed biomass, but are helpful at removing accumulated dead stems and fit well in integrated approaches. Mowing, while not effective in reducing perennial pepperweed stands, can enhance the effectiveness of herbicides. For best results, mow plants at the bolting or flower bud stage and apply herbicides to re-sprouting shoots (Renz and DiTomaso 1998). Flooding populations for several consecutive years during the entire growing season is effective in removing perennial pepperweed, however infestations along levees must also be managed (Fredrickson and Murray 1999). Currently researchers are looking for biological control insects and fungi in native locations in Europe and Asia, but no pests have been isolated. Common native pests include a white rust and other lepidopteran pests. These organisms can prevent seed production, but do not appear to limit vegetative spread. Intensive livestock grazing through the growing season can effectively suppress populations, but once livestock are removed, perennial pepperweed populations quickly recover, therefore grazing should be integrated with other tools. Several postemergent herbicides can reduce perennial pepperweed populations, but repeat applications in combination with re-vegetation are needed to prevent reinvasion (Young et al 2002). In areas with a dense buildup of thatch, mow or burn old shoots before applying herbicides. Herbicide application timing is critical as herbicides work best when applied at the flower bud stage (Young et al 1998). If herbicide cannot be applied at the flower bud to flowering stages, mow plants and treat re-sprouting shoots. See table 1 for a list of herbicides available. For all herbicide applications, it is important to read the herbicide label BEFORE making any application, as different herbicides will have different requirements and restrictions. Many products*‡ 2,4-D ester or amine Depends upon formulation (1 - 2 lb a.e.) Anytime plants are actively growing, best results at flowerbud to flowering stages Yearly applications required for 2 or more yrs to control established stands. Selectively controls broadleaf plants. Raptor + MSO + Nitrogen Imazamox 6.0 fl oz/A (0.047 lb a.e.) Apply to spring or fall rosettes in crops (alfalfa). Has soil residual activity. Controls several broadleaf and annual grass species. Provides season-long suppression. Pursuit + MSO + Nitrogen Imazethapyr 6.0 fl oz/A (0.095 lb a.e.) 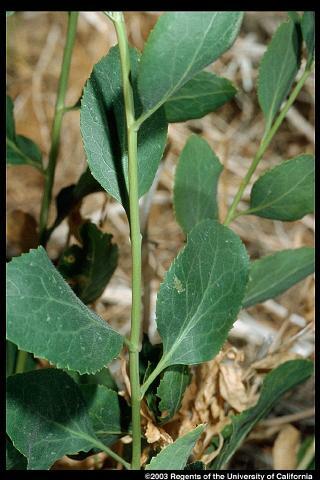 Apply to fall or spring rosettes in crops (alfalfa). Has soil residual activity. Provides season-long suppression. Arsenal/Habitat‡ Imazapyr 8 - 16 fl oz/A (2 - 6 oz a.e./A) Anytime plants are actively growing, best results at flowerbud to flowering stages. Residual herbicide. Nonselective. Many compounds*‡ Glyphosate Depends upon formulation (3 - 4 lbs ae/A) Mow plants when bolting and apply to resprouting foliage Nonselective. Results variable if do not mow, or limited resprouting occurs. Element Stewardship Abstract for Lepidium latifolium L.
Element Stewardship Abstracts (ESAs) are prepared to provide The Nature Conservancy�s staff and other land managers with current management-related information on species and communities that are most important to protect, or most important to control. The Abstracts organize and summarize data from many sources including literature, researchers and managers actively working with the species or community. 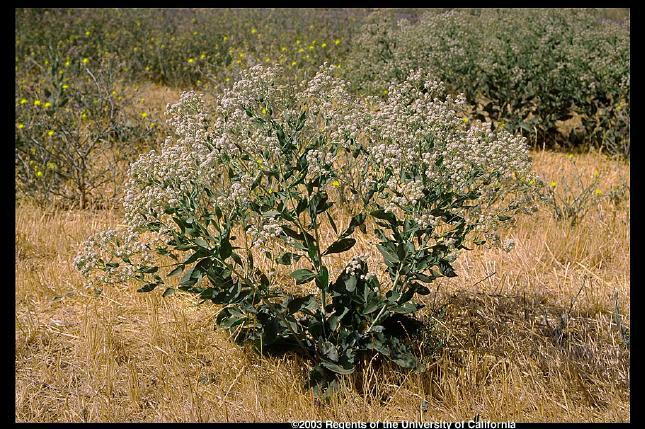 University of California's Agriculture and Natural Resources' Pest Note on Perennial Pepperweed. Montana State University guide to Perennial Pepperweed. A University of Nevada publication on Perennial Pepperweed. This is a brochure by the Weed Research and Information Center at the University of California. 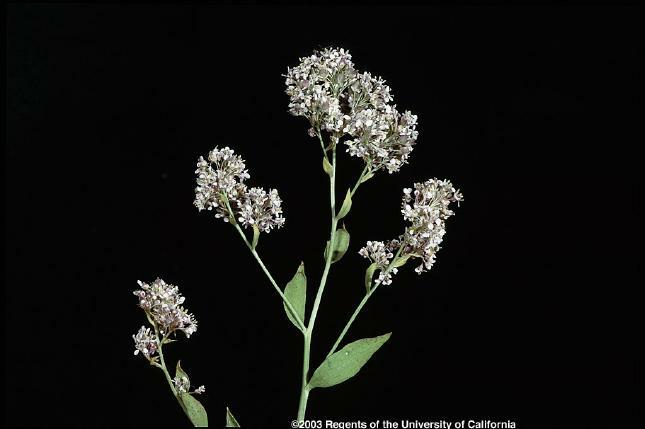 The University of Nevada's page on a related weed, the Tall Whitetop (Lepidium draba). 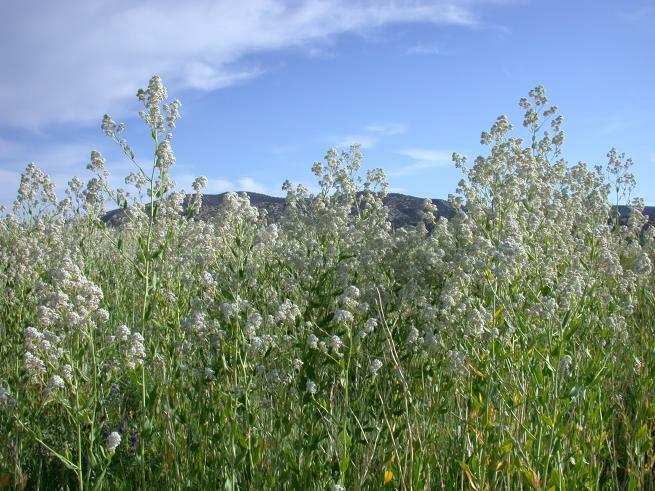 A special publication by the University of Nevada's Cooperative Extension Service about a related weed, Tall Whitetop (Lepidium draba). DiTomaso, J.M. and E. A. Healy. 2003. Aquatic and Riparian Weeds of the West. Univ. of California Agriculture and Natural Resources. Oakland, CA. p. 171 �175. Eiswerth, M., W. Johnson, S. Lewis, and L. Hughes. 2001. The economic costs of delaying invasive weed control: an illustration based on Nevada�s tall whitetop initiative. Nevada Cooperative Extension publication SP-01-08. Miller, G.K., J.A. Young, and R.A. Evans. 1986. Germination of seeds of perennial pepperweed (Lepidium latifolium). Weed Sci. 34:252-255. Renz, M.J. 2002. The Biology, Ecology and Control of Perennial Pepperweed (Lepidium latifolium L.). Dissertation Univ, of California, Davis. Pages 129. Renz, M.J. and J.M. DiTomaso, 1998. The effectiveness of mowing & herbicides to control perennial pepperweed (Lepidium latifolium) in rangeland & roadside habitats. Proc. 1998 California Weed Sci. Conf. vol.50: 178. Young, J.A., C.D. Clements, and R.R. Blank. 2002. Herbicide residues and perennial grass on establishment perennial pepperweed sites. J. Range Manage. 55: 194-196. Young, J.A., D.E. Palmquist, and R. Blank. 1998. The ecology and control of perennial pepperweed (Lepidium latifolium L.). Weed Technol. 12:402-405.